At Drake Scaffolding we often find ourselves working not only in the local Plymouth area but also across Devon, Somerset, Cornwall and other areas of the South West. Only recently one of our major projects took us to Newton About to support the pending renovation of The Queens Hotel. 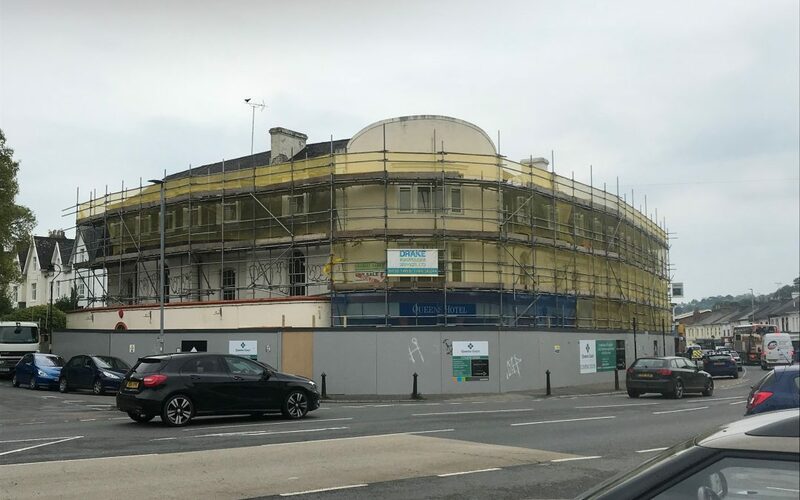 As you can see from the pictures, this project is quite an extensive one as the Queens Hotel in Newton Abbot is about to undergo major renovation to develop it into apartments as part of a joint venture by developers Killian construction and Go Develop. This once popular hotel has now been closed for three years and was on the market with previous buyers able to secure change of use from hotel to residential premises. The property went back on the market and then the developer stepped in and bought it with plans to breathe new life into the now derelict and run-down premises. The Queens Hotel, built in the 1850s and once a popular hotel in South Devon, has been neglected since its closure a little over 3 years ago and has been subject to various acts of vandalism. 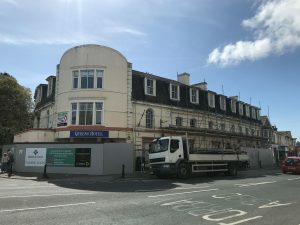 Now Teignmouth company Killian Construction, supported by Go Develop, are all set to transform this former popular hotel and make it something that the town can be proud of. Plans include a total of 21 apartments with 11 parking spaces and locals support the project as it will breathe new life back into the town. We are delighted to have worked on this exciting Newton Abbot development and look forward very much to seeing the finished result and what it will add to the local area. If you have an enquiry about a Newton Abbot scaffolding project then do not hesitate to get in touch.